Nothing smells like Christmas more than a real Christmas tree. But are Christmas trees toxic to cats and what, if any, risks do they pose to our feline family? 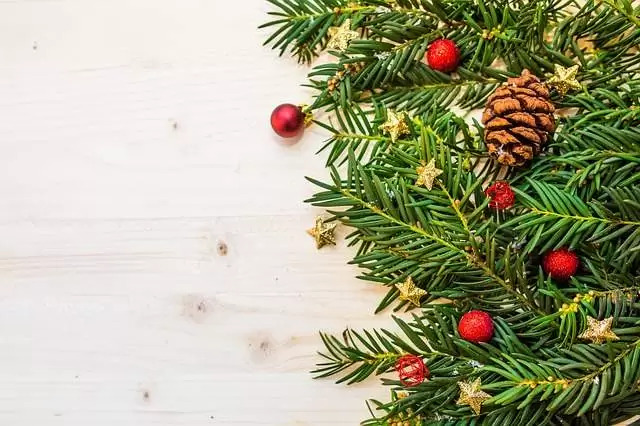 Spruce and fir are non-toxic to cats, however, there is conflicting information on the toxicity of pine, therefore it is better to err on the side of caution and avoid pine trees. Even non-toxic Christmas trees still pose a risk to cats. Sharp needles can cause damage to the gastrointestinal tract if they are swallowed. Pesticides, fertilisers and tree preservers can leech out of the soil when the tree is watered which can pose a danger if the cat drinks the contaminated water. Injury if the tree falls on the cat. Angel hair tinsel (the long, slender strands) is attractive to cats and can cause a severe and life-threatening telescoping of the intestines or a gastrointestinal obstruction if ingested. Tinsel can cause a gastrointestinal obstruction if enough is ingested. Christmas lights can cause electrocution and tissue damage if the cat chews through the wire. Broken Christmas decorations can cause injury if stepped on. Small ornaments can be swallowed and cause a gastrointestinal obstruction. When you bring the tree home, saw 1 inch off the base which will help the tree to take up more water and shed fewer needles. Put the tree into water immediately after the but end has been sawed. Set the tree up away from heat sources such as radiators or vents and windows as these locations will dry the tree out faster, causing it to lose more needles. Secure the tree to a wall, to do this, make a sling of strong fishing wire around the tree and secure to a hook in the wall. Add Christmas lights deep inside the Christmas tree, not only does this reduce the risks of a cat chewing on the wire, but it looks prettier if you can’t see the wires. Any leftover wire between the bottom of the tree and the plug can be covered in clear plastic tubing. Unplug lights from the wall when not in use. Choose a tree that holds onto its needles for longer. These include the Nordmann fir, Douglas fir, and Balsam fir. Use a tree stand with a covered water reservoir to prevent your cat from drinking the water. If you don’t have a covered tree stand, place foil over the water. Avoid tinsel if possible, but if it is a must on your tree, only use on the higher branches. Add plastic ornaments to the bottom of the tree and more delicate ones higher up. Secure well so that they can’t be batted off. Do not hang chocolate decorations on the tree, chocolate is toxic to cats. Where practical, place the Christmas tree in a location away from furniture the cat can use to launch itself upon the tree. Next articleCan Cats Eat Shrimp and Prawns?